Following on the heels of last year's "In the Midst of Beauty," which reunited veteran heavy metal guitar hero Michael Schenker (Scorpions, UFO) with Gary Barden, the original singer in the post-UFO Michael Schenker Group, the pair team up again for a more acoustically-oriented outing that is just as rewarding as their metal work. Not that this is an "unplugged" project; while Schenker mostly plays acoustic guitar here, electronic keyboards provide much of the background and harmonies. But it is a largely acoustic setting, and, as Schenker points out in the liner notes, it's really an extension of this three previous "Thank You" instrumental albums which featured a ton of acoustic work. In fact, Schenker writes that he originally recorded the dozen tracks here as instrumentals  only afterward handing them off to Barden and producer Michael Voss to add vocals and other backing instrumentation. Schenker shows that he would still have excelled had he followed a route into acoustic music rather than the metal he has devoted his professional life to. 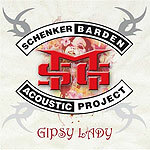 Bending notes, using vibratro, working in gypsy and Spanish figures, Schenker shows his acoustic forays are no gimmick. The guy can simply play anything with strings you set in front of him. And Barden shows that, unlike a lot of metal screechers, he can actually sing when called upon. His voice is a bit rough around the edges, but he sings with good control and a sense of passion. But what holds this album back is the same thing that's kept Schenker from breaking through into mainstream stardom his entire career: A lack of a killer song. The 12 compositions here are all OK  but he's not had a hit on his own, and that won't change with this release. "Loving You Sunday Morning" from the Scorpions' 1979 "Lovedrive" LP has been his only real hit (although "Rock Bottom" and "Doctor Doctor" from UFO's 1974 album "Phenomenon" have become metal staples)  Schenker just doesn't seem to have a facility for writing memorable tunes. It may be that Michael Schenker is going to be the Chet Atkins of metal  a guitarist so insanely gifted that other people practically beg him to play on their recordings, but someone whose own projects, while graced with that same virtuosity, suffer by comparison due to the lack of a breakthrough hit.